The food blogger gods are on my side in 2012... a new day job has me working in University City rather than commuting an hour away from the food haven of Philadelphia each day. That can only mean one thing: more lunches to write about! 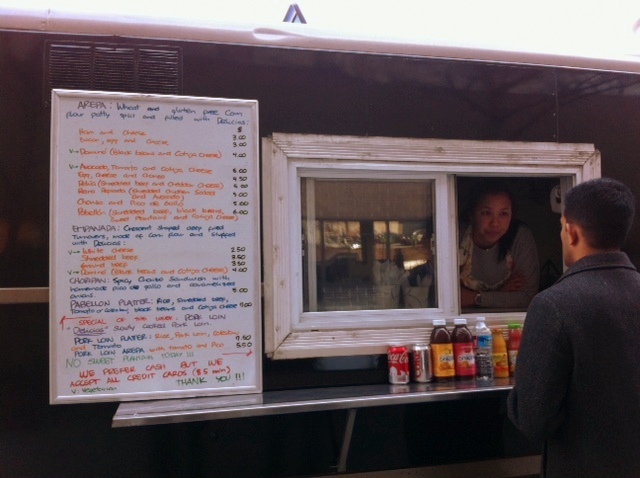 Midtown Lunch recently highlighted Delicias, a new Venezuelan-themed food truck at 34th & Market near Drexel/Penn. These awkwardly warm winter days have been perfect for venturing out at lunchtime so I gave Delicias a try. Choripan Sandwich - look at allll those onions! The chorizo sandwich, called a Chorpian ($5), was great. It's a long, soft, toasted roll with several pieces of sliced, medium-spiced chorizo, covered in homemade pico de gallo and caramelized onions. Admittedly, I picked off a handful of onions so I wouldn't totally stink up the office, but there were still plenty left to enhance the flavor. The pico de gallo had a nice kick but not more than my sally-pants could handle. 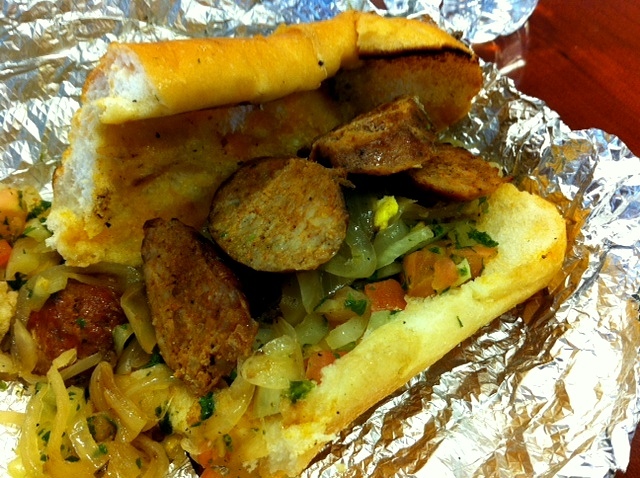 Also key in food truck lunch excursions, the Choripan traveled well back to the office. It had a good 15 minute walk to survive but the tight foil wrapping worked well. The fried empanadas weren't quite as lucky. My shredded beef one ($3.50) was still relatively warm and had good flavor, although the outside lost most of its original crisp. The salty white cheese empanada ($2.50) is definitely best devoured during the walk back. The cheese had cooled and hardened by the time I got to it. Know that empanadas in Venezuela are also corn-based, so they don't taste quite the same as white/wheat flour Argentinian and Spanish empanadas you may be more used to. Wikipedia's listing for "empanada" includes a lengthy and interesting list of all the varieties around the world, in case you're curious. I wasn't a huge fan of the saltiness of the cheese or the corn breading (I prefer flour tortillas with Mexican food, too) but I'd give it another try fresh out of the frying pan. The co-workers with me represent both gluten-free and vegetarian diets, so they were pleased to see options for both on the menu. Delicias' signature Venezuelan item - the arepa - is made with corn flour patties so it is both wheat and gluten free. The corn patties are split and filled with a variety of yummy-looking options. The avocado, tomato and cotija cheese arepa got a thumbs up but my male co-worker commented that it was a bit small for his lunch. 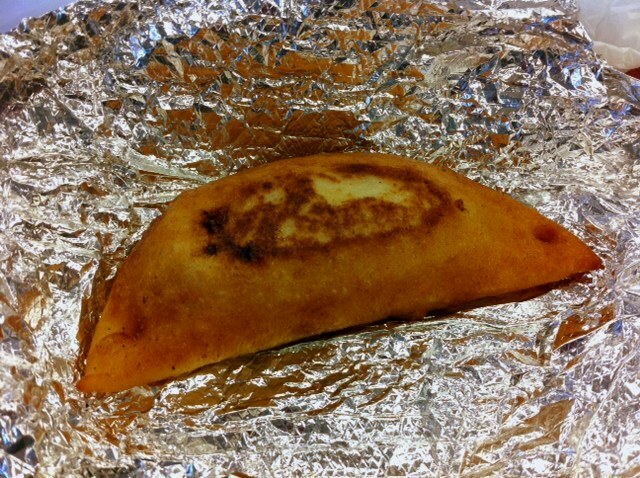 Lesson learned: an empanada on the side might help fill you up. Perhaps the Domino empanada with black beans and cojita cheese ($4), which also got a positive review. The empanadas are pretty big so one as a side is all you need. 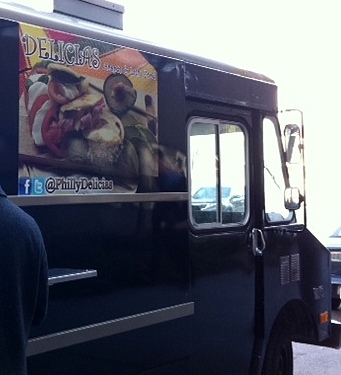 Follow Delicias on Twitter for menu updates, location info, etc. Simple wipe-off board menu with weekly specials. Delicias doesn't have a big sign - look for the black truck with this smaller sign, usually near Chewy's. Hey, I tried Delicias during our brief stay in Philly and I loved the Choripan Sandwich. It actually made me want to have our own mobile food truck.